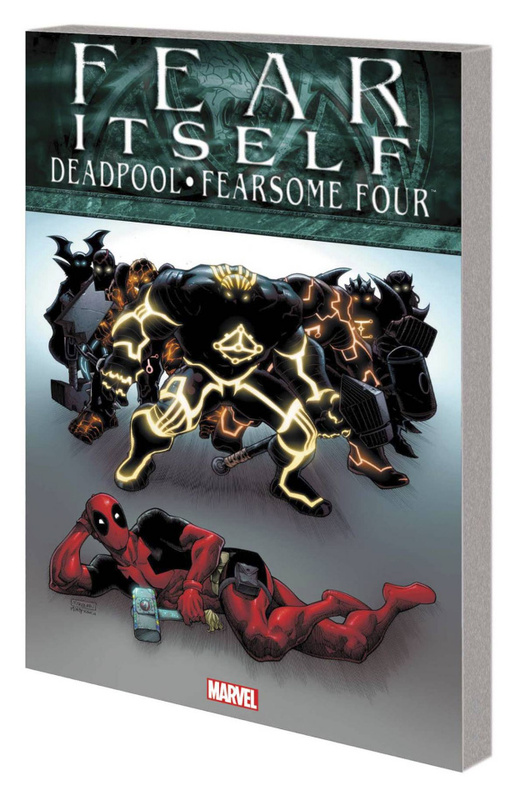 A double dose of FEAR ITSELF starring Deadpool and the Fearsome Four! The Merc with a Mouth cooks up a plan to turn a profit from FEAR ITSELF by creating his own Worthy out of a sledgehammer and dimwitted D-lister the Walrus, whom he dupes into putting the scare into some local yokels in New Mexico. But the plan goes pear-shaped when it turns out the hammer has powers of its own, and the tusked twit brandishing it gets wise to Deadpool's ploy. Then, everyone's favorite suit-wearing fowl, Howard the Duck, joins up with Nighthawk, She-Hulk and Frankenstein's monster as the band of oddball heroes chases down the swamp monster Man-Thing, who has been driven mad by the mass hysteria resulting from the Serpent's attack on humanity! Collecting FEAR ITSELF: DEADPOOL #1-3 and FEAR ITSELF: FEARSOME FOUR #1-4.